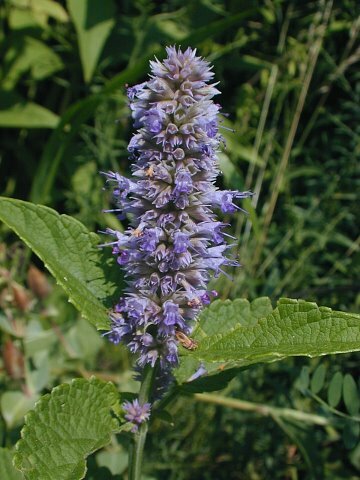 Agastache scrophulariaefolia is a perennial herb, about 1 m tall tall, branched above, stem sharply 4-angled, slightly winged. Leaves opposite, egg-shaped, base slightly lobed, usually finely hairy below. Flowers purple, irregular, petal tube 2-lipped, 5-lobed, stamens longer than petal lobes, calyx lobes triangular to lance-shaped; inflorescence of branched, racemes at top of plant; blooming and fruiting July-Sept. Frequency in NYC: Very infrequent, possibly extirpated in NYC.